Do you use Pinterest? If yes, you now have one more reason to love your boards. Pinterest now allow you to create 'Secret Boards', you may call them as a private board. It was the most demanded features of users and finally the secret boards are available for everyone. The boards can be used to create a private bookmarks and photos that you do not want to share with anyone else. Currently you can create maximum 3 secrete boards and the previously created boards cannot be converted into private boards because someone might have already repinned your pin. To create a Secret pinboard, scroll to the bottom and you get the option. 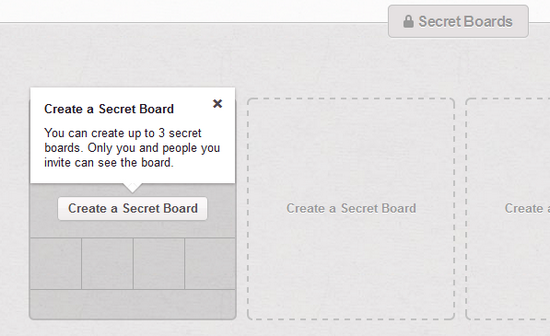 If you do not have one, you can simply click on 'create a board' and then set the option of secret to 'ON'. 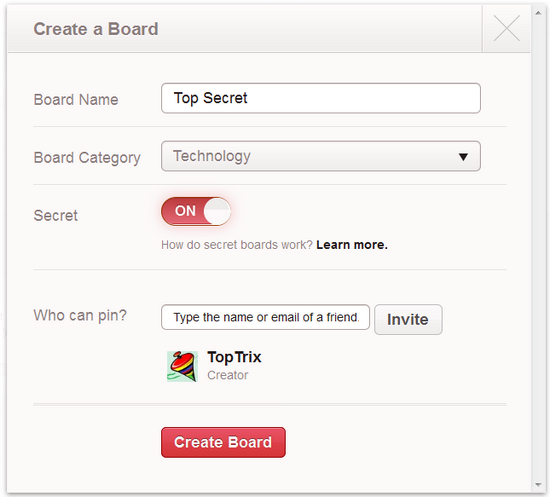 You can allow others to pin to your secrete board by inviting them via a username of with an email address.